While in Soldotna, we went fishing on the Kasilof River with Kenai Outfitters, It was truly one of the most memorable experiences during our vacation in Alaska. - Colorado Springs, CO.
Kenai Outfitters is a terrific fishing guide with tremendous river fishing knowledge, excellent drift boat skills, and the patience to teach us the intricacies of King salmon fishing. - Boise, ID. holds one of the Fishing Trophies. 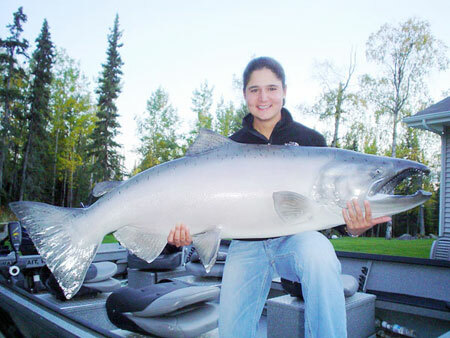 In a program designed to encourage the release of the giant king salmon the Kenai is famous for, the Kenai River Sportfishing Association (KRSA) will award a fiberglass trophy mount to anglers who land and release fish measuring 50 inches or more. 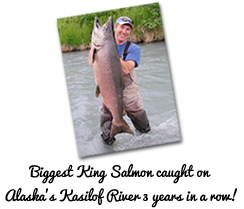 The Kenai River king salmon are world-famous for their size and fighting ability, with 80 and 90 pounders reported each season. Even so, numbers of these gigantic fish have decreased over the past ten years. That decline has concerned the public. Under this new program, anglers can experience the thrill of catching a lunker Kenai King, let that trophy go to spawn and still hang their bragging rights on the wall. The Kenai River is known as the only place in the world that anglers can grab their gear, jump in a boat and have a chance of catching the next world record. This new KRSA program will help sustain that reputation by putting more big fish on the spawning beds to the benefit of their future generations as well as ours. • Anglers must hold a valid fishing license with a participating registered guide. • Guides participating in this program must be licensed with the state of Alaska, and current member of KRSA. • To qualify, an angler must catch and release a trophy fish measuring 50 " long or longer. • An affidavit of the catch and release with the signature from the guide, the angler and one additional witness will be required. • Fish will be verified with a photo of the fish in the net next to the yardstick. • The photo and affidavit must be delivered to the KRSA office within 7 days of the date the catch and release occured. • Only one fish per year per angler can qualify for this program. • All guides and anglers must comply with all applicable ADF&G regulation. • A $800 certificate will be awarded to the approved angler. Upon recieving the photo of the angler and the finished reproduction along with the paid taxidermist invoice, the angler will receive $800. This program is for the month of July on the Kenai River.